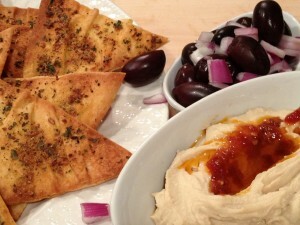 Perfect for dips of fava or humus, I have to admit eating them just as they are – seriously addictive stuff! This is a great recipe to make with children too. Try making a batch – you won’t be disappointed. I like to use very large pita bread, anywhere from 8-10 inches in diameter. You can certainly use smaller breads if that’s what you have on hand. Do not separate the bread to make a pocket as you would for a Greek salad. Instead, lay the whole bread flat and, carefully, completely brush the oil/spice/herb mixture over the bread. I brush only one side of the bread but feel free to flip them over and cover both sides. Then, carefully cut the oiled bread into triangles of your desired size with a sharp pizza cutter or knife. A quick note about pita bread. Pita bread that you traditionally find in both mainland Greece and many of the islands has no pocket. Real Greek pita bread is thicker and, well, more bread-like. These pitas cannot be slit. Cypriot pita bread is the only one that I know of that is thinner and can be slit. Here in the US, I most often use Arabic pita from my local Middle Eastern grocery. These are big and round , very flat and can be slit into a pocket. Arrange the pita bread triangles on a large cookie sheet and bake for between 7-10 minutes at 400 degrees until they turn a light brown color. Mix olive oil and chili flakes well, crushing flakes into the oil with the back of a spoon. Incorporate all remaining ingredients into chili oil mixture. 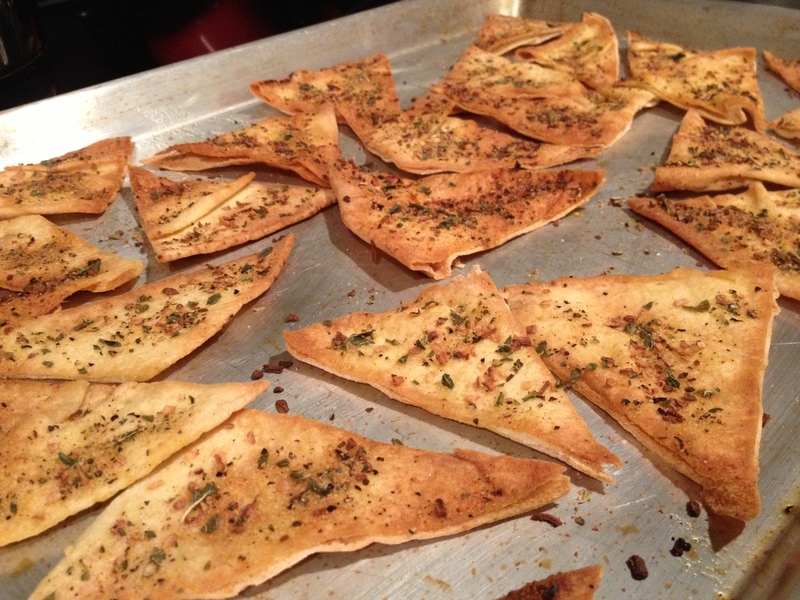 Brush pita bread well with oil/spice mixture and cut into wedges or triangles with a sharp knife of pizza cutter. Arrange pita chips on a large flat baking sheet and bake for 7-10 minutes at 400 degrees until a light golden brown. Eat warm from the oven or store in an airtight container for up to 2 weeks. Remember to save any remaining oil/spice mixture to use with dip as seen above with humus/chili oil for a spicy twist!